A damning new study has suggested China holds threatening influence over Bitcoin (BTC), and perhaps even the ability to attack and ultimately destroy the entire Bitcoin network. According to the paper, China has both “mature capabilities” and “strong motives” to perform a variety of attacks against Bitcoin. Even worse, it is already exerting its power over Bitcoin in a myriad of ways. The paper establishes its thesis by proving the Bitcoin mining ecosystem has become “heavily centralized.” Cryptocurrency miners have banded to such an extent that “over 80 percent of Bitcoin mining is performed by six mining pools,” with five of those managed directly by individuals or companies based in China. The primary threat to Bitcoin’s infrastructure is the “51% attack,” which consists of mining pools teaming up to control a majority of the hash rate (Bitcoin’s overall processing power), allowing them to directly influence much of what happens on the Bitcoin network. When you consider the combined effort of Chinese mining pools accounts for 74% of Bitcoin’s hash power, the situation becomes incredibly unsettling. The fact that Chinese mining pools control so much of the Bitcoin ecosystem has direct consequences. In particular, having such centralized hash power exposes the Bitcoin network to rampant censorship and other potentially damaging attacks. The paper has also revealed a certain unfairness to how mining rewards are being distributed – and how the current setup is making Bitcoin inefficient. The alleged culprit is China’s Great Firewall. It purportedly distorts the playing field by adding latency for miners operating outside of its borders. Apparently, Chinese mining pools can have priority for deciding which blocks to mine, especially empty blocks. Even though they take the same time and power to mine, empty blocks do not contribute anything to the network, as mining them does not process any transactions. Still, they carry all the same rewards as full blocks. When researchers looked at the combined average rates of empty blocks produced by each mining pool – something strange was occurring. Chinese mining pools produced an unusually high rate of empty blocks – spiking well above 7% (over certain periods). 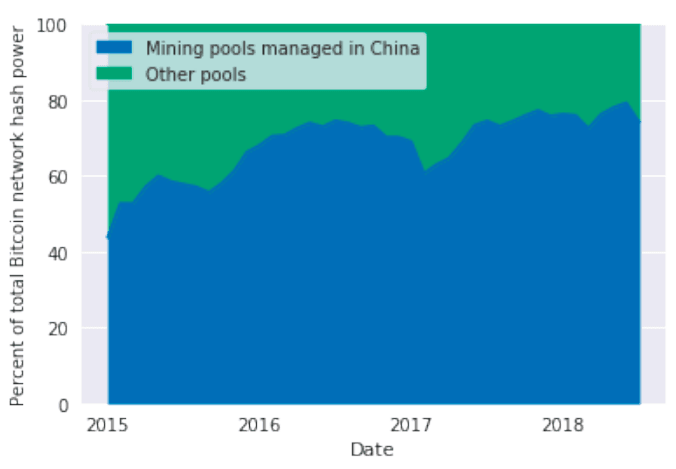 Non-Chinese mining pools produced around 2%, a historically consistent rate. The researchers conclude there must be some factor that applies to Chinese miners, but not other miners that has incentivized the mining of empty blocks. Again, when miners mine empty blocks, the entire network becomes less efficient. Not only are no transactions processed, but the overall network consumes costly resources in the process. There are some advantages to mining empty blocks, but only for the individual who mines it. Mining empty blocks can move the miner up in the queue for receiving new (less empty) blocks to mine, increasing the likelihood of netting more mining rewards than others. This effectively means China’s social policy has a direct impact on Bitcoin’s integrity. The research defines four attack classes: censorship, demonetization, weakening consensus, disruption to competing mining operations. In total, the academics identified 19 different attacks currently available to Chinese mining pools. 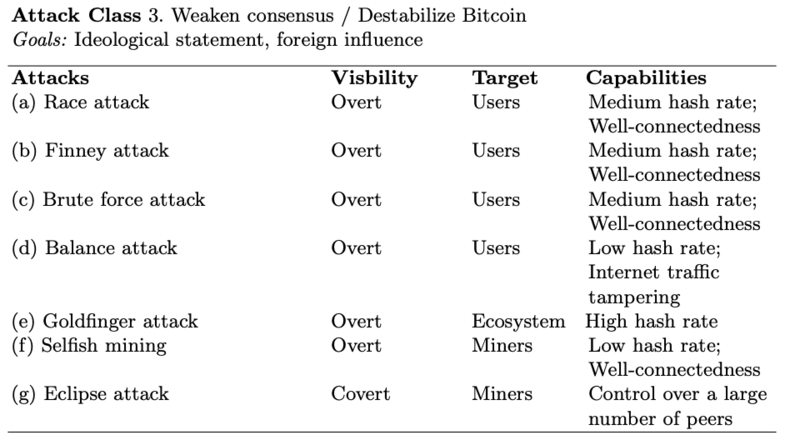 Below are the attacks geared towards destabilizing the Bitcoin network as a whole. One of the scariest is a Goldfinger attack – in which mining pools apply their combined hash power to control (and ultimately kill) Bitcoin. The Big Q: Why would China destroy Bitcoin? The Big A: The researchers speculate Bitcoin is in “ideological opposition” to China’s centralized governing philosophy; totalitarian Communism. Even more worrisome, the researchers believe China could actually weaponize its control over Bitcoin in order destabilize foreign economies. Editor’s Note: This article 1st appeared in Bitcoin Insights.